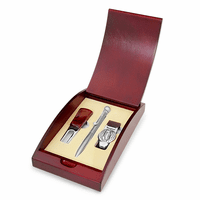 This desktop business card holder and pen stand features a lightly polished rosewood base and gold accents that will coordinate beautifully with any desk. 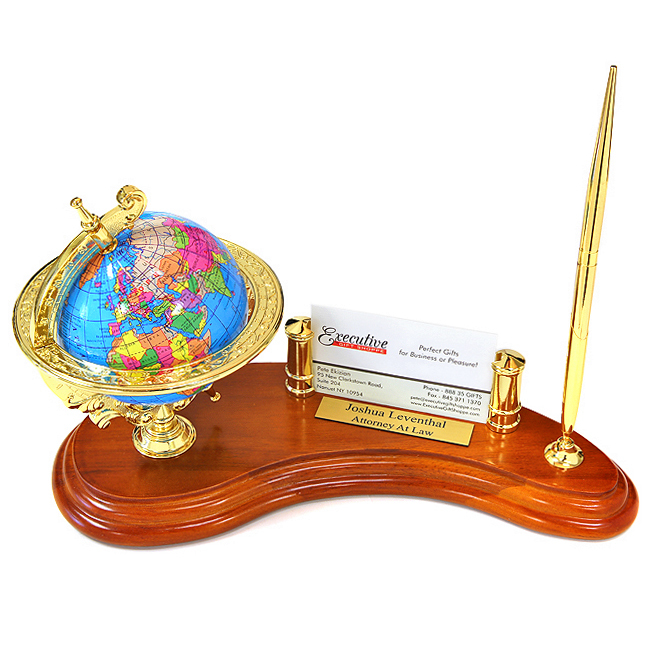 It has a vibrantly colored globe set in a rotating gold tone acrylic base. A gold tone business card holder holds up to twenty business cards between its posts. 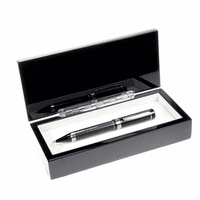 Finally, a hinged pen stand comes with the smooth writing ballpoint pen included. The wood base has a felt lined bottom to protect your desktop. 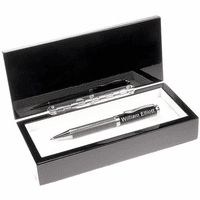 Add a custom engraved gold plate to the area in front of the business card holder free of charge. This personalized desktop globe and pen stand is an ideal gift for a special co-worker or recently promoted loved one. Dimensions: 10 3/4" x 4 1/4" x 6 1/4"
This gift was presented to our Boss on Boss's Appreciation Day 2017. He LOVED it!!! This is our second year purchasing this particular type of gift and I will remain using Executive Gift Shoppe for ALL my appreciation/recognition gifts!!!! !